TNT Major Crimes airs tonight with an all-new Monday, September 12, 2016, and we have your Major Crimes Season 5 Episode 12 recap below! On tonight’s Major Crimes episode the second in a 3-part arc, Sharon is disturbed by her own reaction to the case and seeks penance. 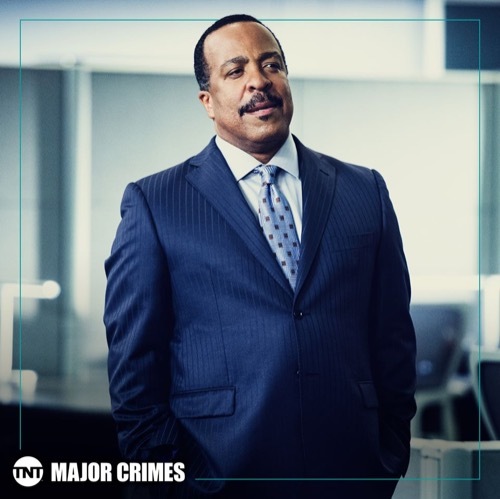 Did you watch the last episode where Major Crimes detectives audited the trial of serial killer Dwight Darnell and ended up facing their most deadly case ever? If you missed it we have a full and detailed Major Crimes recap, right here for you. On tonight’s episode of Major Crimes as per the TNT synopsis, “The Major Crimes unit continues to investigate the conspiracy behind Dwight Darnell’s murders and his links to the Zyklon-Brotherhood. Sharon Raydor, disturbed by her own reactions to the case, seeks penance in the Ritual of Confession. Dwight Darnell was dead however Captain Raydor wasn’t sorry about that. She had apparently talked things over with her priest and he had given her absolution for taking someone’s life. But Raydor hadn’t felt apologetic and she it was her lack of her remorse that worried her more than anything. So the priest asked Raydor to talk about what she was feeling and she told him her fears. Raydor told him that she was scared that fighting monsters would eventually turn her into one. And yet she never was scared about doing her job until this white supremacy case spiraled out of control. Dwight Darnell had been accused of purposely targeting and murdering people and families of color. So Dwight should have spent the rest of his life on death row before his time finally came up. Yet, the white supremacist managed to thwart justice by going on a shooting spree in the middle of his own trial so Major Crimes had been asked to investigate how he had been able to do it. And the first place they looked at was Dwight’s former contacts though no one that they knew about was willing to talk to them and the DA didn’t want to make any sort of deal just to get information from another supremacist. So the team had been forced to look into a dead deputy. The police had unfortunately gotten a tip that the late Deputy Simms had known Dwight so the police investigated Simms and found out that he had been on the take. The deputy had plenty of money stashed in an offshore account and strangely he had an Asian girlfriend that worked in the judge’s office where she had access to the gun that Dwight ultimately used in his spree. Though what was even stranger than a white supremacist in a committed relationship with a woman of color was the fact the clerk had known what type of man Simms was. Hai Sun, which was the girlfriend’s name, had later been found dead at a place known as Naziland for its strong affiliations with the white supremacist crowd. However, an autopsy showed that Hai Sun had a Nazi tattoo on her hip that she got around the same time she began dating Simms. So she had known that her boyfriend was a supremacist and apparently that hadn’t bothered her in the least although it did appear that her approval of her boyfriend’s lifestyle had lead to her death. Both Hai Sun and Simms had been murdered so that had been clear sign that someone was cleaning house. Although, to check out their theory, the police had to bring in one of their own. Like the SIS Detective that they had working in the Z Brotherhood working undercover. So the detective created a pretense to get himself fired and from there he was able to make contact with his handler. Who like Detective Wes felt that they should leave him in the organization where he was in prime position to collect more information yet not everyone agreed with that assessment. Chief Howard for instance was still new in his position and he didn’t want to have to deal with the fallout of another dead cop. Raydor on the other hand thought that more information would be helpful. Detective Wes had told her what little he knew about Dwight’s father and it seemed like he heard the same story as everyone else. That Dwight’s father had been a Marine who he had been killed in actions. Yet, the police felt the father angle was more important than it first looked and Wes did get the impression that there was another leader in the shadows that was pulling the strings while someone like Jordan Graff was out there riling the troops. So this father angle was something everyone wanted to explore. Dr. Joe though wasn’t much help. Joe had had plenty of sessions with Dwight to get a sense of the other man and he also said that Deputy Simms had sat in on most of the sessions. But Joe didn’t remember Dwight ever mentioning his father and therefore he didn’t see the importance. So the information that Wes was able to provide them was crucial. Wes had infiltrated the Z Brotherhood when another man was in charge and he had been closing to finding himself in the inner circle though Jordan Graff’s presence ruined all of that. Wes said that Jordan came out of nowhere and just pushed him into leadership. So it had been Jordan’s idea to suddenly make war on the other races and the scariest part about Jordan’s sudden rise was the fact the other man didn’t even seem to care about the money angle. Which was how Naziland had supported itself for so long. Though Wes hadn’t been able to provide anything else about Jordan so the police managed to twist events in order to get Wes the proper introduction he needed. Raydor apparently had Wes arraigned like any other crook and that placed him in the same cell as a Z Brotherhood messenger boy was so that he could find out what Jerry Vogel had been told and why Wildred Darnell hadn’t been allowed to see her son. Wildred it seems had wanted to see her son Dwight and had kept being told by Jerry that Dwight didn’t want to see her. So the police wanted to know why that was because they wanted to know if the Brotherhood had been worried that Wildred would have talked her son out of committing a massacre. However, Wildred refused to talk and Jerry’s later assistance was eventually ruled out. Jerry had been judged and indicted as a rat while he was in jail so he had later tried to make a deal with the police. And had somehow ruined his only chance to get Jordan Graff to talk. And so the police were at a loss. Everyone that could help them weren’t talking and Jerry needed to be placed in protective custody where he wouldn’t be able to gather information for them because Jordan had figured him for a rat. So tonight’s episode of “Major Crimes” ended with little to no answers about what was really going on with the Z Brotherhood. Yet, the one bright side in this whole mess was that Buzz was slowly getting closer and closer to finding the man that killed his father.